Ashberry Homes’ launch new showhome in Victoria Gardens, part of the Peters Village community. A new showhome at a development in Wouldham, Kent, has opened its doors to the public. The Ashberry Homes’ scheme, named Victoria Gardens, makes up part of the Peters Village community. The housebuilder has reported that both the showhome and a new viewhome, located off Hall Road, are proving very popular. 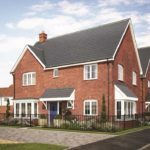 Emma Hamlett, Sales Director for Ashberry Thames Gateway, said: “We are proud to be delivering a collection of high specification homes within the Peters Village consortium in Wouldham, supporting the regeneration of the area and providing new homes for a large number of would-be purchasers. Victoria Gardens is made up of a collection of two-bedroom apartments and two-, three-, four and five-bedroom houses, part of the newly-formed Peters Village in Wouldham.